It was a tragedy that brought the death and destruction of the Second World War right to the heart of a quiet Norfolk village. On the morning of 20 November 1940, as residents of Northrepps, near Cromer, began to wake, the village was shaken by the crash of an RAF bomber in woodland on the outskirts. The aircraft was returning from an aborted attack on an oil refinery at Lutzkendorf, Germany. Of the four crew members, three were killed. 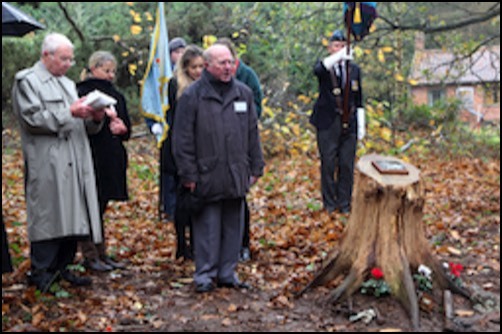 Seventy five years on, relatives of the crew joined villagers at a ceremony at the crash site to commemorate those lost and to unveil a plaque on the stump of a tree knocked down by the impact of the crash. The Handley Page Hampden of 44 Squadron had set off for a target in eastern Germany, but had to turn back. The aircraft was returning to RAF Waddington, in Lincolnshire, when it crashed near the Norfolk coast at about 6.30 am. The exact cause is unclear, but the aircraft had been hit by enemy fire and it is thought that one engine had failed. Sgt Jack Ottaway, Pilot, Navigator Archie Kerr and Wireless Operator/Gunner Sgt Stanley Elliott were killed. 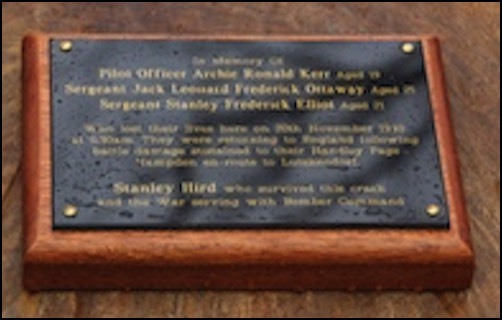 Gunner Sgt Stanley Hird survived the impact. A couple of curious coincidences subsequently came to light. Stanley Hird, the lone survivor of the crash, died ten years ago in Canada. 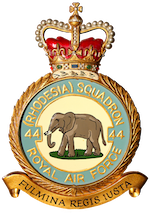 It transpired that he had previously been in a Hampden crash-landing, and the pilot on that occasion had successfully brought the aircraft down in the very same village of Northrepps. Plt Off Archie Kerr, the navigator, had also survived a ditching off Lowestoft earlier in that year. Sgt Ottaway, the pilot, who was 25 years old when he died, left a widow, Barbara, and a two year old daughter, Virginia - named after her father’s favourite brand of tobacco. His brother, Herbert, was the Ottaway half of Hadley & Ottaway, the Watton-based removals firm. We Weren’t That Low - Were We?